The Government strategy for all public sector centrally procured construction projects to be delivered using BIM by 2016 has created major changes in the construction industry in the methods used to design and build offices, homes and other civil engineering projects. Building Information Modelling (BIM) now allow effective collaboration between architects, engineers and constructors in order to ensure the best possible designs, reduced material wastage and that projects are constructed ‘right first time’ minimising the need for rework. All this allows construction projects to be achieved with better quality outcomes at lower cost and on time. 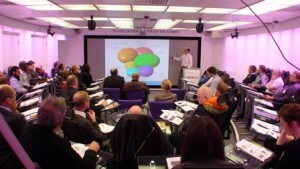 On the 19th May 2015, THINKlab opened its doors to 38 local professionals (architects, engineers and civil engineers) for a workshop about these changes and to see first-hand some of the ground breaking research being carried out by the THINKlab. Professor Jason Underwood from the School of the Built Environment and Prof Martin Simpson from Arup gave presentations around how BIM is impacting the construction industry and how it is benefiting the companies that adopt this approach. The workshop concluded with an overview by Prof. Terrence Fernando exploring the role of visualisation in team collaborations and project management and the opportunities offered through these technologies to enhance current practices within design and engineering teams. 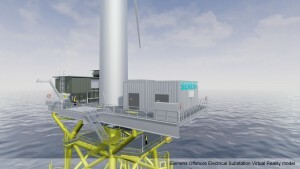 Demonstrations were also provided of THINKlabs advanced collaborative virtual reality platforms and guests also experienced the next generation in VR, The Oculus Rift displaying some of the recent visualisation projects carried out by THINKlab including work for the multinational engineering company Siemens, where THINKlab have created a virtual model of an offshore wind turbine. Users can ‘walk around’ and explore every aspect of this massive structure (including the sub-sea foundations). This allows the design to be tested and optimised in terms of accessibility for maintenance and evacuation routes in case of emergency; without the virtual model any problems would only be evident after construction and would require costly rework. The session concluded with an extremely lively networking and discussion session with all the delegates very impressed with the THINKlab capabilities and the depth of knowledge at the University around BIM. The workshop received a large amount of interest with representatives from Turner & Townsend, Halliday Meecham Architects, Bentley Systems, Leach Rhodes Walker, Cunliffes, Howard Grady Associates to name but a few.